Nitrotek were the first to bring you the complete all in one box Nitro kit and these have been one of our most popular items since the day we introduced them. To build on this success we are now adding some electric self build kits to our range. The model here is our self build brushless powered Raptor Truggy, which is also available pre-built here. 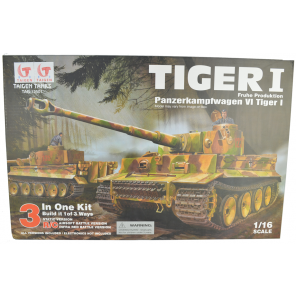 These kits are perfect for those who enjoy building models as much as using them! Forget Lego etc, these self build kits provide hours of fun and when they are finished they are actually fun to use! For the hours of use and enjoyment you will get from first building and then racing them, these kits are amazing value for money. If you are new to electric RC cars then buying a self build kit is a great way to learn about the hobby and see how they work before going out and racing them. We sell some self builld models to schools as they are educational and a great introduction to mechanics and engineering. There is no other product on the market that gives such a complete all in the box kit like this. Brushless motor systems are a new technology that until recently have only been available as upgrades for normal RC cars. This is because to have a brushless setup not only requires the brushless motor but also a brushless ESC, Li-Polymer battery and special Li-Polymer charger which are all very expensive and would cost hundreds of pounds. Then came some brushless 1:16 scale brushless models that due to their smaller size only needed a smaller brushless motor etc so could be priced at a realistic level AND NOW... We are pleased to introduce the full 1:10 scale Raptor brushless RC truggy self build kit. With a big brushless motor and 11.1V Li-Polymer battery these models are ridiculously quick and at an amazing price! Unlike other self build kits on the market that only include the basic chassis and none of the electronics etc, these kits include all the components needed to build them! Brushless motor, ESC, pistol type radio equipment, grease, oil etc - everything is there, even the tools needed to build them. Construction will take around 8 - 12 hours on average and is recommended for ages 14+. The special motor in this kit is much quicker than the motors found in other models. Because it is brushless it also means the motor needs no maintenance and can handle a lot more power being pumped into it. So to take full advantage of that the standard 7.2v Ni-Mh batteries that are found in most RC car kits has been replaced with a very powerful 11.1v lithium battery along with a balanced lithium battery charger which is needed for these special batteries. All you need once the model is fully constructed is 4 AAA batteries for the transmitter, then you can let her rip! Hello - thank you for your question. Unfortunately we currently do not have a specific date as to when this will be back in stock however I would advise you to add this to your wish list. Hi, if i had 6 of them can they all race at once on different channels? Hello, As this would be my first build gulp. What are instructions like if any included with this model and how easy it ? The instruction for this model come in the form a large book, will detailed images and written guide for the full assembly. Does the kit come with a controller? bought, built and drove, absolute rocket. unfortunately hit a puddle and motor failed after about 4 minutes. as it was a 'own' damage i didn't bother with warranty so fitted a spare waterproof motor and esc i had. WOW, now all reset it will fly way past the 50kmh my problem is i am a bit slow controlling the turns with such phenomenal responsiveness and speed. might buy another. i've not got it yet but i've hade a go and it is awesome!!!!!!!!!!!!!!!!!!!!!!!!!!!!!!!!!!!!!!!!!!!!!!!!!!!!!!!!!!!!!!!!!!!!!!!!!!!!!!!!!!!!!!!!!!!!!!!!!!!!!!!!!!!!!!!!!!!!!!!!!!!!!!!!!!!!!!!!!!!!!!!!!!!!!!!!!!!!!!!!!!!!!!!!!!!!!!!!!!!!!!!!!!!!!!!!!!!!!!!!!!!!!!!!!!!!!!!!!!!!!!!!!!!!!!!!!!!!!!!!!!!!!!!!!!!!!!!!!!!!!!!!!!!!!!!!!!!!!!! Got this kit for Christmas and after spending an enjoyable eight hours building it I took it out and broke a front wishbone it was so fast so having now replaced it I have been ragging it around earls court one with loads of space and it is awesome so fast . My only negative is the frontwishbones are weak so upgrade to ally ones but apart from that this car is a nitro killer.